When the temperature jumps to 109 degrees and your kids are bouncing off the walls with unspent energy, where do you go that won’t cause heat stroke, dehydration or heat exhaustion? I have a solution to your problem! …PumpItUp! The Inflatable Party Zone! They are currently getting ready to celebrate their 4th anniversary on August 31st! Congrats! This will be a special event in that it will offer a free “open bounce” from 5:00pm-8:00pm with groups of 25-30 kids being moved through two bounce zones every 30 minutes (equalling 1 hr of open play for each attendee). Probably the most exciting thing about this anniversary, however, is that Banerjee is going to accept donations to support the American Society of Autism. Banerjee has hosted events for the Southwest Autism Research & Resource Center (SARRC) before along with many private parties for autistic children’s groups. Banerjee confided, “the (autistic) kids really seem to enjoy themselves…something about the environment awakens something in them and they truly have some amazing fun!”. Banerjee added that he is careful to consult parents in attendance about the environment (ie. music volume and selection) to make sure that he creates the best environment possible for these special needs children. “We have a deep appreciation and concern for autism in our community…these families are truly special and have given us some sobering insights into the struggles faced by autistic children and their caregivers,” says Banerjee. “This is our way to give back to the community that has supported us these last four years,” he adds. If you have ever been to a BounceU or Jump and Shout, then you will be very familiar with this type of indoor inflatable playground. The North Phoenix location boasts two arenas of over 4000 square feet each, filled with various inflatable activities. 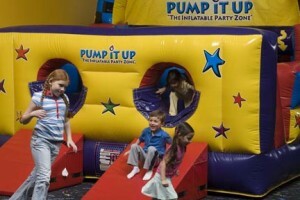 PumpItUp has a brightly colored and exciting atmosphere to offer even the most seasoned bouncer! There are 4 valley locations (Tempe, Scottsdale, North Phoenix and Arrowhead) that offer open bounce times as well as scheduled private parties for all ages. For those of you who are bounce-savvy, you might be interested to know that PumpItUp was actually the original “indoor bounce zone”, later adapted by BounceU and others. But now, even BounceU falls under the corporate umbrella of PumpItUp Holdings. I spoke with Swapan Banerjee, owner and operator of the North Phoenix PumpItUp! location on August 26th about his operation. His facility holds two open bounce sessions per week for smaller kids (6 and under) as well as one session per week for older kids (although these older kid bounce sessions are only available during the summer months and are discontinued during the school year). The open bounce price is $7 per child and siblings two and under can enter free. In order for the two or under sibling to enter for free, though, there needs to be an older sibling that has paid admission. While they offer these open bounce sessions as opportunities for prospective clients to sample the goods, private parties are their bread and butter. They specialize in children’s parties but have even hosted corporate parties for adults; after all, you don’t stop playing because you get old, you get old because you stop playing! For more info: Visit the PumpItUp website or you can contact the North Phoenix Location at (623) 434-7867 or visit their location at 22515 N. 18th Drive in Phoenix, AZ 85024-1356.